As chairman of the Federal Reserve (1979-1987), Paul Volcker slayed the inflation dragon that was consuming the American economy and restored the world's faith in central bankers. That extraordinary feat was just one pivotal episode in a decades-long career serving six presidents. 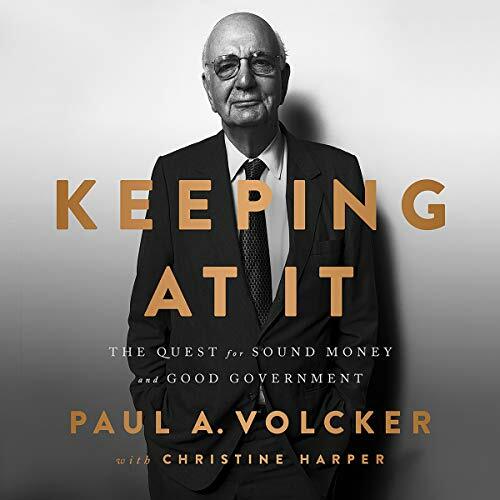 Told with wit, humor, and down-to-earth erudition, the narrative of Volcker's career illuminates the changes that have taken place in American life, government, and the economy since World War II. He vibrantly illustrates the crises he managed alongside the world's leading politicians, central bankers, and financiers. Yet he first found his model for competent and ethical governance in his father, the town manager of Teaneck, NJ, who instilled Volcker's dedication to absolute integrity and his "three verities" of stable prices, sound finance, and good government. I remember watching Paul Volcker on T. V. during the seventies when he was Chairman of the Federal Reserve. He stood 6’7” and towered above everyone. This book is Volcker’s memoir. He stated he never planned on writing a memoir but recent changes in society and government have triggered him to do so. The book is well written and researched. Volcker states he wants people to understand why and how The Volcker Rule, which is part of the Dodd-Frank regulatory legislation, came about to protect the public. As most readers are aware, the regulation has been continually chipped away at. Volcker is apolitical and has served every administration since Eisenhower. I particularly enjoyed his comments about the Schools such as the John F. Kennedy School of Government at Harvard and the Woodrow Wilson School of Public and International Affairs at Princeton. Volcker has dedicated his life to public service. I found the book interesting not only about his life but also his insights into our current monetary situation. I enjoyed this book and learned a great deal. The book is ten hours six minutes. John Bedford Lloyd does a good job narrating the book. Lloyd is an actor and has won several Earphone Awards for audiobook narration. I noted that Lloyd is 6’5’’ inches tall. It caught my eye as Volcker is 6’7”. Wow! This Was Just What I Needed. This book is like a course in economics from the basic to the world level. I read the House of Morgan and got a historical world overview of banking and this book added so much flavor to that foundation. To hear the history of Paul Volcker and all the many accomplishments far beyond the Fed Chair just reminds me of how much we don't know about other people in general, and all the ways that they interact in the world and how all those things find ways of interacting through each of us. I am so grateful to have listened to this audiobook and delighted in the voice and cadence of the narrator, John Bedford Lloyd. This book is one that was hard to pause. I wanted to go through to the end and then wanted more. Thank you to all involved in this great work. Excellent book. I wish he talked more about the 1982 bear market, and also more about fighting inflation. A great insider historical background on global economics. Was extremely useful for my graduate studies in public policy. Volcker explains complex topics simply and conveys critically important information. it's amazing how much of monetary policy is still being understood and created. Volcker is an absolute narcissist who believes he and other big government goons know what's best for society and anyone who dare question them is foolish. Time and time again, he and his cohorts put forth bad monetary policy, debase our currency, watch the system xollapse, blame us, rinse and repeat. He is an absolute narcissist and the best part about it is that his time is over. Buy gold. Buy silver. Hold on and get ready for Volcker's real legacy.